For more than a year, a big sidewalk shed has been hiding the front of The Centurion, the West 56th Street condo building (between Fifth and Sixth Avenues) that is legendary architect I.M. 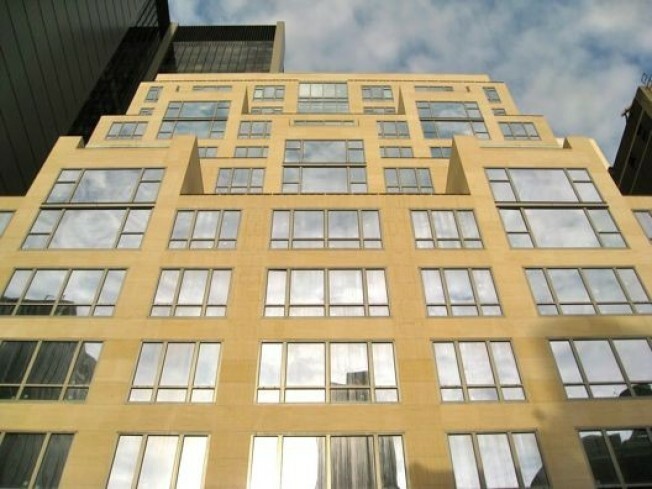 Pei's first New York residential project since the newly-landmarked Silver Towers. Now that shed has come down, revealing acres of unadorned limestone interspersed by two big cut-outs, one for the peeps and another for their wheels. Up above are additional quarry loads of creamy limestone, framing big windows and covering the balconies that step back in a symphony of symmetry above West 56th Street. From those lofty perches, the gold and glistening confection atop the Crown Building down the block seems close enough to eat. For those living in the rear units at The Centurion, the best thing about their new abodes might be the views they'll have of the flamboyantly topped 29 West 57th Street to the north. That one was put up in 1924 by the Chickering & Sons Piano Company and was once home to Chickering Hall, named for a piano palace and concert venue previously located at Fifth Avenue and 18th Street. The design of Number 29 is by the firm of Cross and Cross and is replete with an army of gold-encrusted caryatids and topped by multi-hued terracotta replicas of France's Imperial Cross of the Legion of Honour, which was awarded to one of the Chickering sons back in 1867. Looking out to the neighborhood, The Centurion has a lot to offer. What's hidden away on the inside will remain a mystery until we get the car parked and take a ride up through all that chiseled stone.